Item #0002: "Our Raw Power Protein Superfood Blend was born out of our wishing such a product existed for our own use. We would talk about how it would be great if there were a 100% organic, 100% raw, 100% vegan, 100% HEALTHY protein powder out there -- with no fillers and no average ingredients -- strictly the best ingredients planet Earth has to offer. After a few years of trying dozens of different ingredient blends, we finally got it just perfect, and here it is, for everyone to enjoy. And we mean everyone: men, women, children, young, old, active, less-active, athlete, vegan, vegetarian, whole-food-eater, etc. The beauty of our product is that it is clean, usable nutrition for every body. Raw Power Protein is for everyone who wants to add premium-quality, vegetarian protein and/or super nutrition to their diet. Raw Power is not just a protein powder, it's a Superfood Blend. In fact, we weren't sure if we should market it as a protein powder or Superfood Blend since it's really both. But we realize that a lot of people out there need and want more clean, high-quality protein in their diets, and that's what they look for. 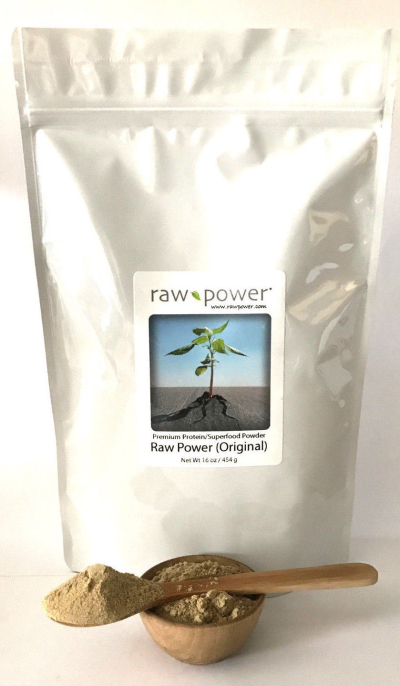 The ingredients in Raw Power Protein Superfood Blend have been carefully selected and formulated to bring you a natural, balanced, nutrient-rich protein product. Hemp Protein Powder is a natural protein powder, containing over 50% protein. Hemp Protein Powder is made from hemp seeds, which have the most complete edible and usable protein in the vegetable kingdom. This high-performance protein powder is easily digestible with 65% globulin edestin and 35% albumin protein - more than any other plant! Brazil Nut Protein Powder contains nearly 50% protein and provides antioxidant benefits with its high selenium content. Traditionally, brazil nuts have been regarded as the most calorie-dense of all vegetarian foods. Maca Powder is an ancient superfood that was consumed by Incan Warriors to increase strength and endurance. Native Peruvians have traditionally utilized this South American root since pre-Incan times for both nutritional and medicinal purposes. Maca is a wonderful source of natural vital nutrients. Goji Berry Powder is a naturally-concentrated extract of what is considered by many to be the world's most nutrient-rich fruit - the goji berry (Lycium). Goji berries have been used in traditional Asian medicine for over 5,000 years. Much has been written about the health-promoting properties of this amazing fruit. Mesquite Powder is a traditional Native American food produced by gathering ripened seed-pods from the mesquite tree and grinding them into a fine high-protein powder (approximately 20% protein). For centuries mesquite has been a source of nutrition for Native Americans and indigenous peoples in the arid regions of the earth. Raw Power! Protein Superfood Blend is for anyone who wants to add premium-quality, vegetarian protein and/or super nutrition to their diet! Suggested usage: Stir or blend two scoops or two heaping tablespoons (1 oz. / 28g) of Raw Power into 12 ounces of fresh juice, water, or smoothie. Click here to view smoothie recipes using Raw Power! Protein Superfood Blends.